A professional-grade core selected and tested by SOTABEAMS for 125 Watt 1:1 and 4:1 baluns; 3 - 50 MHz. For higher power use, the cores can be stacked. Toroid cores are brittle so avoid banging them against hard surfaces. 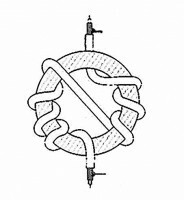 1:1 Baluns should be wound as shown in the diagram below. Each pass through the hole in the toroid is a turn. For 50MHz 3 + 2 turns of RG58 is recommended. For HF 7 +6 turns of RG174 is recommended. Hold the ends in place with cable ties. I bought this to make my own 9:1 UnUn for my end-fed wire antenna. It was big enough to get the necessary number of turns which was helpful. Basically it just works! The UnUn tames the impedance so that I can tune 160 - 12 m. I would certainly buy it again. I have used some of these rings instead for FT 118-43 and it seems to be similar values. This is the real deal, good quality toroids at the right price.They come well packaged ready for my project. The toroid do the job. Not a fake toroid as many in today's market! 1:1 to 1:1.3 from 3.5 to 28 Mhz. Happy with it and I would buy again if necessary. Light weight and easy to wind. Gave a 1:1 on 80m with no real measurable return current.